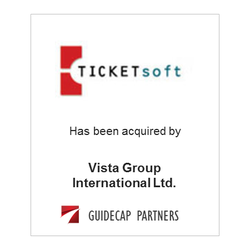 Ticketsoft LLC, a provider of SAAS based cinema management solutions, has been acquired by Vista Group International Ltd, of Auckland New Zealand. Ticketsoft provides software solutions for point of sale ticketing and concessions, self-service kiosks, internet and mobile ticketing, gift and customer loyalty cards.The acquisition will allow Vista to continue its international growth strategy by expanding its North American presence and enhancing its service proposition. GuideCap Partners served as financial advisor to Ticketsoft LLC.